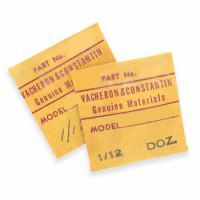 Watchmakers, you've found your source for Vacheron Constantin watch parts! Cas-Ker is proud to carry replacement parts for watch repair of these elegant Swiss luxury watches. It's easy to find the exact Vacheron parts you need, organized by caliber or searchable by part name or number. Cas-Ker Co. is independent of and is not affiliated with or sponsored by Vacheron. Cas-Ker is your source for Vacheron Constantin watch parts, Genuine Rolex parts, Generic Rolex parts, LeCoultre parts, Patek Philippe parts, and other hard-to-find discontinued watch parts. Cas-Ker Co. is independent of and is not affiliated with or sponsored by Vacheron, Rolex® Watch U.S.A. Inc., or other watch brands. The Rolex® warranty does not apply to non-genuine replacement items supplied by Cas-Ker Co.